This dog walk is, perhaps, a little more complicated than necessary. When I first designed it it was to come completely apart. Then I found I never undid the planks so I substituted tape banding for the original elastic cords. Now I think it would be simpler just to use wood and fasten the planks with loose pin hinges. Still this dog walk is very very light and easily put up with no help. The planks are so easy to manipulate I had no motivation to switch to heavier wooden planks. This dog walk is not, however, full length. Each "plank" is five feet long, that is a five foot up ramp, five foot crossing, and five foot down ramp. 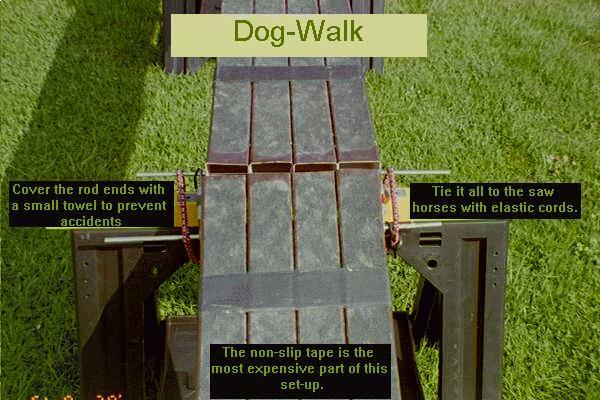 You can get a better idea by looking at some pictures of dogs using the dogwalk. The gutter pipe is not stiff enough to use the entire ten foot length without supports. Because my purpose was to have very transportable equipment I never even tried to make the planks longer. 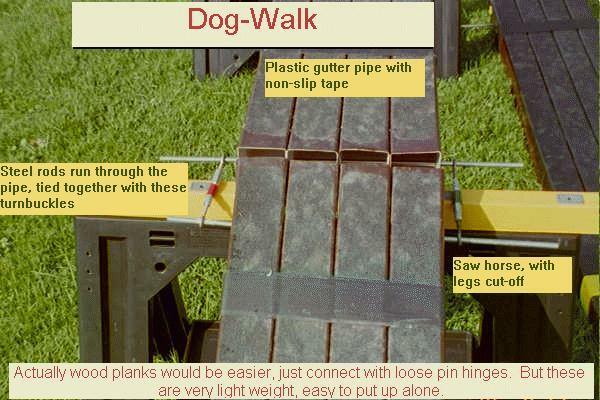 Based on my observations of dogs using the equipment I think the maximum length for gutter pipe planks would be about six feet. In my experience this is plenty long enough. If I was going to rebuild the dog walk using the same gutter pipe I think I would try hot gluing the pipes together to add stiffness, and still use the tape banding. This dog walk has held up very well over the past three years. I live in a moderate climate so I have no information on how it will hold up in cold weather, nor if it is left out in the sun full time. I store my equipment in a garage between uses. On top of the plastic gutter piping is 2 inch wide non-slip tape. Tape sufficient to cover all the planks cost more than all the rest of the components combined. I thought about using strips. It would have been cheaper in the short term, but would not have worn as well. The planks are made of two ten foot sections of 2 inch by 2 inch gutter pipe, cut in half to make four lengths. (I was asked how wide the dogwalk was and being lazy I just guessed - I was wrong so I measured and its 9 1/2 inches). I drilled a one-quarter inch hole through each section so I could run a rod through all four sections (think shish kabob). This helps hold the pipes together and provides stability. The agility equipment links page provides resources for everything from books with construction plans, to budget agility equpiment, parts suppliers, and even competition grade agility obstacles and supplies.